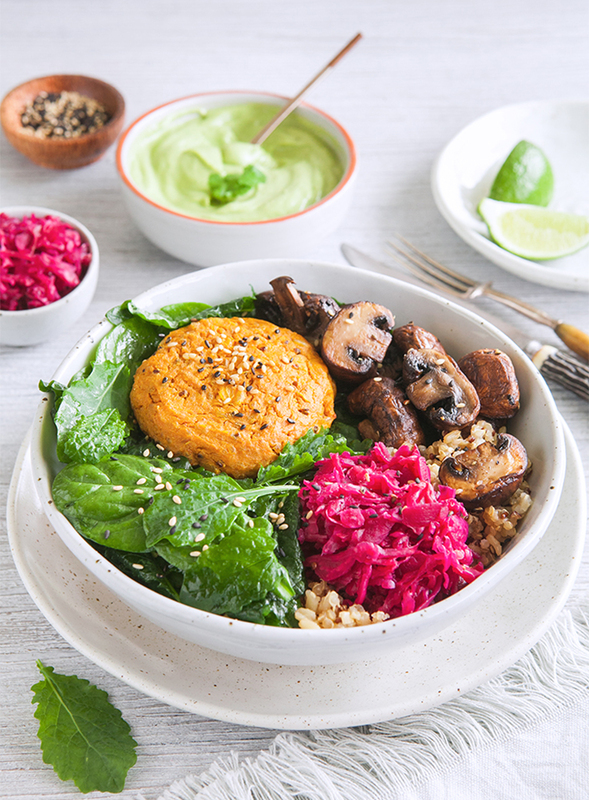 View our Kumara Burger Bowl With Avocado Sauce featuring Living Goodness Heartbeet Kraut. Enjoy a new twist on an old favourite with this nutritious Vegan and gluten-free burger bowl. A tasty kumara burger patty with garlic mushrooms, creamy avocado sauce and beetroot sauerkraut. • Preheat the oven to 180C fan bake. • Peel then steam kumara until cooked and mash well. • Combine kumara with all ingredients for patty, except sesame seeds, in a big bowl and mix well. Chill the mix in the fridge for about 30 minutes. • Divide mix into six parts and roll into patties using your hands. Keep your hands damp as this helps to prevent sticking. • Place burger patties on a tray lined with baking paper and greased with cooking spray. Lightly coat the surface of the patties with cooking oil spray and sprinkle with sesame seeds. Bake for about 30 minutes – turning half way – until the outside patty is nice and crispy. • Combine all ingredients in the blender and mix well until smooth. If the mixture is too thick slowly add some water or lime juice until it reaches the preferred taste and consistency. • Wipe mushrooms clean, trim off the ends, cut into halves, then place in a large bowl. Toss with lemon juice. • Add olive oil to a large heavy pan and heat over a medium-high heat. Add garlic, fry for approx 30 seconds – do not brown, then add the mushrooms and sauté for approx 4 minutes. Season with salt and pepper. • Combine kale and spinach salad mix with olive oil, lemon juice and salt. Toss well. • Add cooked rice to each individual bowl, top with salad mix, kumara patty, sautéed mushrooms, a big spoon of Heartbeet Kraut, a dollop of avocado sauce and then sprinkle with toasted sesame seeds. • Serve the rest of the avocado sauce in a side bowl.